When we began our adoption journey, a child with HIV was not even a remote consideration. our fact basis was a bad 80’s flashback. 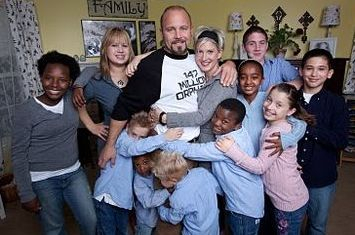 We had 7 biological children, we feared putting them in “DANGER”. We didn’t have a clue. When the idea was presented to us we immediately turned our backs to the concept. Until we received a picture of a sibling group of three. This was at the end of ’06. Through a crash course on HIV, the fear and misconceptions were beginning to be removed. A commitment was made to bring these three children into our family. Our middle son was HIV+. They are and incredible addition to our lives. We can’t imagine that we ever lived without them! Our son is still not requiring medication, and is doing so well. Since then we brought another daughter home, her situation was severe and what would be considered the end stage of AIDS. She too made it home and is receiving excellent medical care. She is doing great on her medication and her viral load is UNDETECTABLE. Life would not be the same without her in it! We have dealt with both ends of the spectrum where HIV/AIDS is concerned. Five years old to 11 years old, male and female. This is DOABLE!! Education and a Pediatric Infectious Disease doctor that you TRUST, are a must. The initial care when they came home was pretty intense. But now, we go to the doctor every 3-4 months for blood work. The medication has become just a part of our day. We use Universal Precautions, as all families should. Our life is not much more complicated than it was before our kids came home. Any additional effort has been more than worth it. So much more that we are returning for our last adopter daughter’s brother and sister. HIV should not be minimized, but neither should the value and preciousness of a child! We have been far more blessed by our children than anything we could possibly give. We would do this again…and again. We will spend our lives advocating for families for children with HIV!